U.S. Secretary of State Mike Pompeo, left, listens to Paraguay's Foreign Minister Luis Castiglioni, during a press conference at "Palacio de Lopez," in Asuncion, Paraguay, April 13, 2019. U.S. Secretary of State Mike Pompeo is scheduled to travel to the Colombian border town of Cucuta on Sunday where he will meet with Venezuelan refugees. Cucuta has taken in many Venezuelans fleeing hunger and violence in their home country. Pompeo has made several stops in South America in recent days to gain support for U.S. President Donald Trump’s stance against Venezuelan President Nicolas Maduro and his regime. Earlier in Asuncion, Pompeo met with the president of Paraguay, Mario Abdo Benitez, for a discussion focusing on Venezuela, human rights, transnational crime, and strengthening democracy in the region. While visiting Paraguay Saturday, the top U.S. diplomat spoke with the Voice of America about the United States’ approach to the Venezuela, which is in a leadership crisis. Pompeo called the election that Maduro claims to have won a “sham,” and he noted that 54 nations have recognized opposition leader Juan Guaido as the country’s true president. ​Questioned about whether Iran has some presence in Latin America, Pompeo said, "There's no doubt. Iranian money remains in South America... supporting Hezbollah, supporting transnational criminal organizations, supporting efforts at terrorism throughout the region." He added, "We see Iran for what it is: the world's largest state sponsor of terror. That's a global threat." And regarding Nicaragua, which is also embroiled in turmoil, Pompeo said, "We want the Nicaraguan people to have all the great things that they're entitled to, that they so desperately want, and [President Daniel] Ortega and his wife both need to change their ways in order to give Nicaragua that very opportunity." Friday, Pompeo urged the people of South America to resist offers of investment and aid from U.S. economic competitors China and Russia, saying the United States is a better friend and investment partner to its regional neighbors. 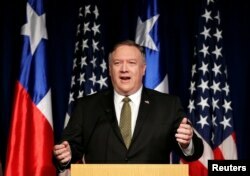 U.S. Secretary of State Mike Pompeo delivers a speech during his visit to Santiago, Chile, April 12, 2019. "We'll continue to isolate Maduro," Pompeo said. "Just this week the Organization of American States voted to give Juan Guaido's ambassador a seat at the table. This is good news." Pompeo said in a television interview with Chile's Mega TV Friday that a U.S. military intervention in Venezuela remains an option. "We will restore democracy," he said. "Juan Guaido is the proper leader of his country. And we'll be with him today, we'll be with him the day that Maduro leaves, and we'll be with him in the days thereafter to begin to rebuild Venezuela." Regarding Venezuela, Pompeo said the U.S. and its allies, such as Chile, "will not quit this fight." He said they will continue to stand up for democracy.